With 32 times the memory of our Weather Envoy, Envoy8X receives and logs data simultaneously from up to eight transmitting stations, in any combination--even eight Integrated Sensor Suites or eight Leaf Wetness & Soil Moisture/Temperature Stations! That means you can get data from 32 soil moisture sensors on one Envoy8X! Includes robust software that allows for data from many sensors and multiple Envoy8Xs to produce very large databases in Microsoft Access®, MySQL®, or Microsoft SQL Server®. You select which sensors to log, and choose a logging interval from 10 seconds to 2 hours. Use archive intervals as small as 30 seconds. You can even add select third-party sensors that report readings in a 0-3 volt range. Data can be easily exported to a spreadsheet program such as Excel®, or to WeatherLink to take advantage of WeatherLink's graphing and reports. Also works with AA batteries (not included). 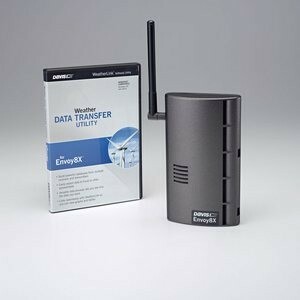 Requires at least one Davis sensor and a WeatherLink USB (#6510USB) or Serial (#6510SER) data logger, sold separately. MS Access run-time engine is included. MS Excel, MySQL and SQL Server are not included. Storage capacity depends upon the logging interval, but is so large that you can download a remote field installation when it's most convenient. For example, an Envoy8X logging two Integrated Sensor Suites and two Soil Moisture/Leaf Wetness stations at a 15-minute update interval will store over 365 days worth of data. Envoy8X has built-in temperature and humidity sensors, as well as a barometer. The software will report data from those sensors as "inside" data, effectively giving you a ninth "station." You may connect an external temperature probe (6475 or 6477) to replace the Envoy8X's internal temperature probe. Receives data from all Vantage Pro2 radios and repeaters. Includes an AC-power adapter; may also be run using Solar Power Kit (7707), or on three AA batteries. Expected battery life is one to four months depending on the logging interval. Requires WeatherLink for Windows (USB or Serial).